Beauty products at discount prices! Please Note: Contact us for salon pricing if you are salon owner and/or licensed professional. A base coat and top coat that helps strengthen and leaves nails a high gloss-looking finish. This special base coat smoothes and protects nails while adhesion-promoting ingredients help bond polish to the nail surface to resist chipping. 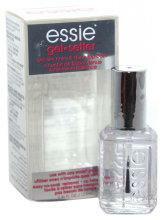 Essie champion of longwear, innovative color-adhesive technology applies smoothly to help bond color to your nail. Provides a barrier to help prevent nail staining. An ideal base coat for sensitive skin and nails. Soothes & moisturizes all types of cuticles. Evens out rough surfaces and fills ridges for a flawless finish. The solution to deep, unsightly ridges. The Fill the Gap! translucent base coat helps create an ultra-smooth base allowing for maximum adhesion of nail polish on a more even surface resulting in a beautiful, shiny and longer-lasting manicure. Key Benefits: Special blend of strengtheners, conditioners, micro-fibers replenish and smooth the nail plate; Natural, reflective mica helps fill in extremely deep ridges; Fine silky particles with soft-focus properties conceal imperfections; and Natural yucca extract helps moisturize and reduce inflammation. Locks in color to transform any polish with a high gloss gel-like finish. No lamp needed and use any nail polish for removal. Contains fast-acting drying agents to help set nails in a flash. Color dries with a protective, high gloss, brilliant shine-looking finish. Effective nail buffer and polish protector. matte colors and increasing needless inventory. Versatile way to update look in between manicures. Contains No Formaldehyde; Toluene or DBP. Protects light nail polish from yellowing (oxidizing) in the sun. Restores polished nails to a salon perfect finish and accentuates the color creating a radiant, luminous shine! Apply as a top coat to natural and artificial nails for optimum shine every other day after a manicure. A botanical hand wash infused with coconut oil, aloe vera and natural glycerin. Ultra-hydrating formula is specially formulated with Vitamin A and E to provide powerful antioxidant protection. Apply to wet hands, lather and rinse.